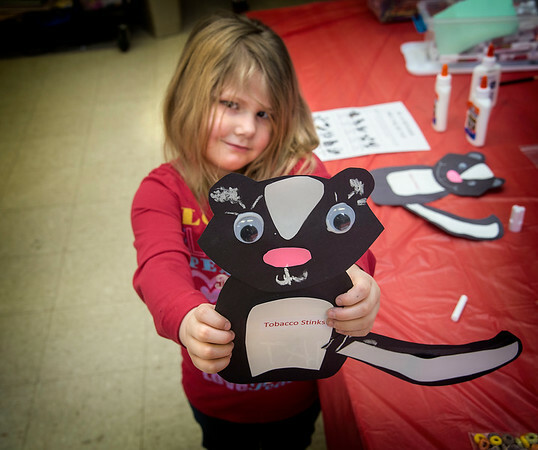 Niagara Falls, NY - Taryn Baughman, 5, joins other kids at the North Tonawanda Youth Center to take part in an interactive carnival where they learn about the dangers of tobacco use through games, trivia contests and educational displays. Hi Michele—Youth in North Tonawanda are holding events this week for national Kick Butts Day, sponsored by the Campaign for Tobacco-Free Kids. Students from the North Tonawanda Youth Center will host an interactive carnival where kids will learn about the dangers of tobacco use through games, trivia contests and educational displays. Time: 4:30 PM. Location: 383 Vandervoort Street, North Tonawanda. Let me know if you plan to cover, send a photographer, or would like to speak with a student/supervisor. In New York, tobacco use claims 28,200 lives and costs $10.39 billion in health care bills each year. Currently, 4.3 percent of New York’s high school students smoke. Students at Sagamore Middle School in Holtsville will commit to a vape-free and smoke-free school community by constructing and signing a pledge wall. Time: 10:30 AM. Location: 57 Division Street, Holtsville. Contact: Lori Hewlett (631) 834-1198. Students at Vestal High School in Vestal will commit to be tobacco-free and encourage peers and loved ones to quit smoking by constructing and signing a pledge wall. Time: 11:30 AM. Location: 205 Woodlawn Drive, Vestal. Contact: Melissa Restuccia (607) 757-2249. Students at Attica Central High School in Attica will commit to be tobacco -free and encourage peers and loved ones to quit using tobacco products by constructing and signing a pledge wall. Time: 11:30 AM. Location: 3338 E. Main Street, Attica. Contact: Leigh Gill (585) 322-5079. Students at Chazy Central Rural School will commit to be tobacco-free and to encourage peers to stop using tobacco-products by constructing and signing a pledge wall. Time: 11:30 AM. Location: 609 Miner Farm Road, Chazy. Contact: Danielle O’Mara (315) 403-0909. Students from the Fashion Institute of Technology in New York will hold an interactive “1 Day Stand” where students will learn about the dangers of tobacco use through games, trivia contests and educational displays, and build support for a tobacco-free campus. Time: 12 PM. Location: 227 W. 27th Street, New York. Contact: Gabriella Potievsky (212) 217-4195. Students from John S. Burke Catholic High School in Goshen will display cups in a fence in front of the school to demonstrate the deadly consequences of tobacco use and the tactics used by the tobacco industry to market their products. Time: 2:40 PM. Location: 80 Fletcher Street, Goshen. Contact: Makeda James (914) 671-9918. Students from the North Tonawanda Youth Center will host an interactive carnival where kids will learn about the dangers of tobacco use through games, trivia contests and educational displays. Time: 4:30 PM. Location: 383 Vandervoort Street, North Tonawanda. Contact: Michelle Seider (716) 343-3208. On March 22, students at Waterloo Middle and High School in Waterloo will educate their peers on the dangers of tobacco by constructing a graffiti wall featuring anti-tobacco facts and messages. Time: 10:30 AM. Location: 65 Center Street, Waterloo. Contact: Stephanie Gatesman (315) 719-4333. All events will take place March 21 unless otherwise indicated. For a full list of Kick Butts Day activities in New York, visitwww.kickbuttsday.org/map. Additional information about tobacco, including state-by-state statistics, can be found atwww.tobaccofreekids.org.